Empire is a free-wheeling game of conquest and diplomatic maneuver. 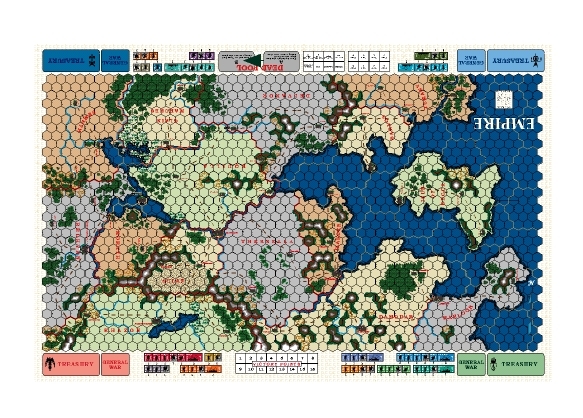 2-4 players struggle for control of the fifteen provinces of a fictional ancient empire. The means at your disposal: outright military force, political intimidation, and diplomacy. Should you altruistically defend a beleaguered neutral province, or join in the attack? Will you bide your time, building your influence in the Empire through peaceful means, or will you send your armies out in swift conquest? Empire rules (6.8 MB PDF) now available. Empire Cyberboard gamebox now available. Cyberboard is a free Play By E-Mail program, available here. 22" x 34" full color map. Over 300 full color, double-sided counters (1/2" and 1"). Political Influence levels in each province -- divide and conquer your enemies! Diplomatic rules covering War and Peace, Neutral provinces, Allies, and Intervention. High replay value -- variable setup for 6 included scenarios makes every game different. Playability -- the economic, political, and diplomatic information is displayed on the map. Empire is released! (November 23, 2000) -- The long-awaited event has finally arrived!